DH and I began thinking about what we’ll be serving this year for Super Bowl Sunday. 1. Heat oven to 350ºF. Lightly grease bottom and sides of cake pan or cookie sheet. 2. Stir together all ingredients, using hands or spoon. Shape mixture into 1-inch balls. Place in pan. High Altitude (3500-6500 ft) Heat oven to 375ºF. Decrease Bisquick to 2 1/2 cups; stir in 1/2 cup Gold Medal® all-purpose flour. Bake 25 to 30 minutes. ~ Cover and refrigerate unbaked balls up to 24 hours. Bake as directed. 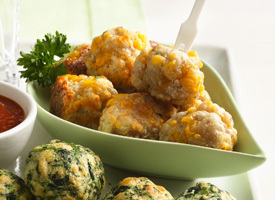 ~ Cover and freeze unbaked balls up to 1 month. Heat oven to 350ºF. Place frozen balls on ungreased cookie sheet. Bake 25 to 30 minutes or until brown. ~ Bake as directed; cover and freeze up to 1 month. Heat oven to 350ºF. Place frozen balls on ungreased cookie sheet. Bake 10 to 12 minutes or until heated through. ~Bake as directed; cover and freeze up to 1 month. Place 6 frozen balls on microwavable plate. Loosely cover with waxed paper. Microwave on High 45 seconds to 1 minute or until heated through. The best part, you don’t need to cook the sausage before using it when making this recipe!